Below is an interesting article I located about the Mowat School that was published on Aug 4, 1967 in the Dauphin Herald. Mentioned is my 2nd great-grandfather, Noah Johnston, as well as my great-grand uncle, George Basham. The article mentions that it cost $600 to furnish the school-house in 1903 and by using the Bank of Canada’s inflation calculator based on the year 1914 (earliest year available) it would have cost them over $12,430 based on today’s standards. When Peter Rudkevitch of Whitehorse, Yukon, arrived in Fork River for his grand-niece’s wedding, everyone began renewing acquaintances and memories went back to school days. School days where? At Mowat school! This is the original Mowat school located on the boundary of Mossey River and Dauphin. Seen grouped in front of it are former pupils who attended school there prior to World War II. 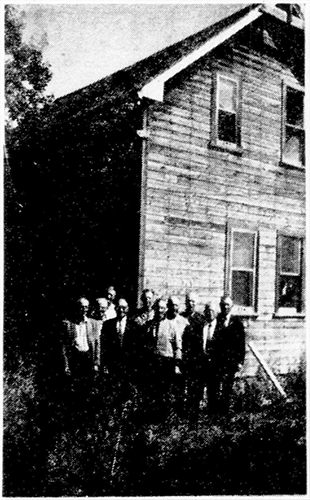 From left to right, front row, are Joe Masiowski, Peter Rudkevitch, Jim Richardson, Joe Rudkevitch; second row, Metro Brezden, Jim Johnston; back row, Tom Miller, George Miller and Mike Brezden. Mowat school was organized by George Lacey in the year 1903. He spent many days walking from home to home by trails, as there were may children of school age, but no roads or phones, but he felt the necessity of an education for all, and his many miles of walking resulted in a first general meeting being held at the home of Noah Johnston, N.E. ½ S12-29-19 in June of 1903. The first trustees were George Lacey, Charles Clarke and Noah Johnston, with George Frame as chairman and Thomas Richardson as secretary. The first school was built and furnished for approximately $600. The name was chosen to honour Sir Oliver Mowat who served as one of the Fathers of Confederation. This is a group of former pupils shown at the present school. They attended prior to World War I and prior to 1939. 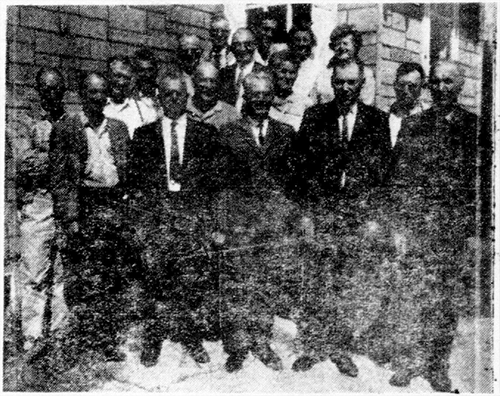 They are from left to right, front row, Joe Masiowski, Joe Rudkevitch, John Zabiaka, Fred Solomon, Mike Brezden; second row, Earl Gower, Tom Miller, Jim Johnston, Mrs. Joe Masiowski, Henry Solomon; third row, Ernest Johnston, Metro Boreyko, Peter Rudkevitch, Mrs. L. Carriere, Mrs. Jim Johnston; back row, Jim Richardson and William Zabiaka. In the Mowat school vicinity still reside Mrs. W. Mullen, formerly Hattie Lacey, and Joe Rudkevitch, who entered school when the doors were first opened in 1904 with George Basham as teacher. Mrs. Emma Rice and Jim Lintick were teachers well remembered prior to World War I. Between the two World Wars, teachers who were spoken of at the reunion were: Miss Grace Beach, Mr. Jarvis, John Main, Miss Reta Breaker, and C.D. Voigt Others were mentioned, but names seemed difficult to recall. In 1920 a new school containing two rooms was built to accommodate some 80 pupils. The primary room included grades 1 to 4, and the secondary room grades 5 to 11. in 1921 the present school inspector, C.D. Voigt was the primary teacher and D.A. Dahlgren (brother of C.N. Dahlgren, Dauphin) was the principal. Since the Second World War, the two-room school was destroyed by fire and a one-room school was replaced by the Dauphin-Ochre Area board in 1951. Many prominent men and women of Canada have been products of this country school. One in our Canada’s present field of education, John Slobodzian is federal inspector of Indian schools. In September 1967, one hundred years after Sir Oliver Mowat prominently figured in Confederation, the school doors will open again for another year with Mrs. Stanley behind the desk to teach grades 1 to 7. And so the school bell will still ring for Mowat school after a history dating back to 1903. 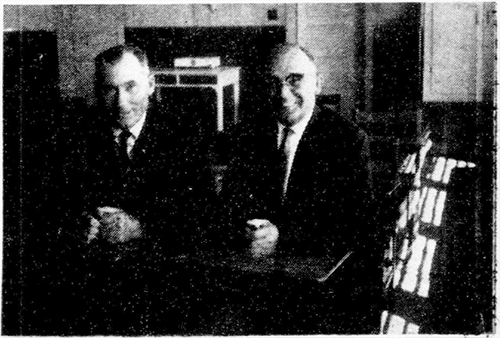 It is a note of interest to learn that Fred Solomon and Peter Rudkevitch, right and left respectively, sat in a double desk in the school for seven successive years. The two seen here in happy frame of mind, no doubt have been reminiscing about some of the mischief they got into when teacher had her back turned.